From the Grammar School, across the River Dee in Chester, to the bus station on Delamere Street was a walk of about a mile - across the Old Dee Bridge, up the hill of Bridge Street, over the cross and up Northgate Street to the bus station. I had exactly 30 minutes to complete this journey after school finished, just allowing time for at least one book-stop along the way. I had at this time developed a liking for short stories of the more macabre kind, having grown up on a diet of the more traditional ghost stories. There were two choices. A passage to the left of the imposing front of Chester Town Hall led past the bar once run by the legendary Everton Centre-Forward, Dixie Dean, into Chester's indoor market. Here was located a 4-sided stall run by one Mark Bloom, who had the enviable knack of knowing exactly what comics and cheap paperbacks would appeal to an 11-year old, with a penchant for horror. The second option was a short diversion down Watergate Street to Thompson's, a newsagent with a surprisingly good stock of cheap paperbacks with sensational covers, more or less opposite the impressive God's Providence House. 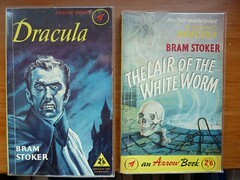 It was from these two non-traditional sources of books that during the early 1960's I built up a small, but valuable (to me, at least) collection of paperbacks containing ghost and horror stories, in the days when W H Smith and established booksellers did not stock such material. 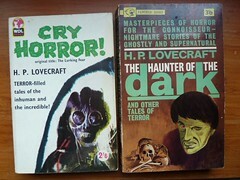 Pre-eminent amongst these was my first collection of H P Lovecraft, the World Distributor's Library edition "Cry Horror". I don't know why Lovecraft's complex and sometimes tedious writing style appealed so much but there was something about the stories, the language and the descriptions that captivated me and stories such as 'The Colour out of Space', 'Pickman's Model', 'Arthur Jermyn' and 'The Nameless City' remain favourites after more than 50 years. 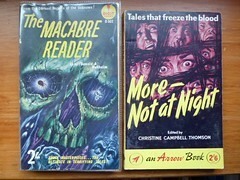 This was followed up by an excellent Panther collection "The Haunter of the Dark and Other Tales of Terror". These stories introduced me to the towns of Lovecraft's imagination: legend-haunted Arkham (actually witch-ridden Salem, with it's historic sites and many-gabled houses) and Innsmouth (Lovecraft's beloved Marblehead). It was at Arkham's Miskatonic University Library that seekers after dark secrets could find a copy of the "Necronomicon" by the mad Arab Abdul Alhazred, whose enigmatic couplet "That is not dead which can eternal lie and in strange aeons e'en death may die" is much quoted in Lovecraft's stories. Since then, my family and I have wandered in Lovecraft's footsteps through the streets of Salem, Massachusetts, and Providence, Rhode Island, and have sought out early Arkham House titles in the latter's bookshops. Lovecraft is one of the few writers of what might be called pulp fiction (he first published in "Weird Tales" magazine) to make the transition to being recognised as a serious writer, as evidenced by the inclusion of a volume of his best works in the Writers of America series. 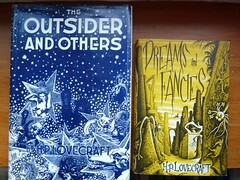 It was not however in Lovecraft's New England, but in up-market Santa Monica on the Californian coast, that I finally found my copy of the "The Outsider and Others", the first Arkham House title and the first book publication of Lovecraft's best work. Having a very understanding family, it was perhaps not surprising that on my 60th birthday, my elder daughter presented me with another Lovecraft Arkham House title, "Dreams and Fancies", almost 50 years after my initiation into Lovecraft's strange world. Also published by World Distributor's Library was the excellent collection "The Midnight Reader", with a very good introduction by Philip van Doren Stern. In here were to be found such masterpieces as 'The Yellow Wall Paper', by Charlotte Perkins Gilman, in which a woman becomes obsessed with the patterns in the wallpaper of her bedroom and ends up crawling round the room over the body of her horrified husband (who has fainted in shock at her state), and Algernon Blackwood's 'The Willows'. Excellent stories were also to be found in the Digit collection "The Macabre Reader", edited by Donald A Wollheim and the early volumes of Herbert van Thal's series of Pan Books of Horror Stories. I particularly liked John Martin Leahy's 'In Amundsen's Tent' in "The Macabre Reader". 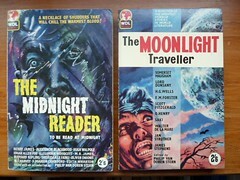 This collection also contained Lovecraft's 'The Thing on the Doorstep'. 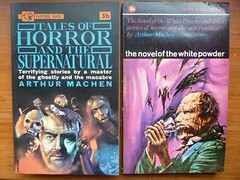 Panther published several volumes of Arthur Machen (of whom more will be said in a later blog) including "Tales of Horror and the Supernatural". 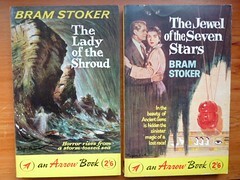 These were rapidly added to the bedside table as also were the Arrow editions of Bram Stoker's tales of the supernatural. 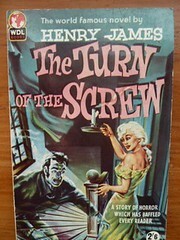 I also recall the thrill of finding on the Market stall the World Distributor's Library edition of Henry James' "The Turn of the Screw", in which edition, with its lurid cover, I first read this ghostly masterpiece. I still find the never-ending debates on this story fascinating, but as would be expected for a dedicated reader of ghost stories, I am inclined to think the Governess entirely sane and the phantoms of Peter Quint and Miss Jessel not of her imagination, but real projections of malevolent forces through the tenuous veil that separates our comfortable world from the dark forces lurking at the threshold. Following this initiation into such stories, there followed a long period in which university studies and career building limited opportunities for seeking out new authors and those I did seek out were of a more serious literary nature. 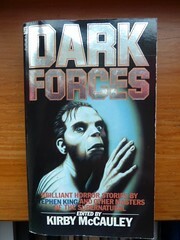 However in 1981, I bought, on an impulse, the excellent compilation "Dark Forces", edited by Kirby McCauley. This introduced me to a new generation of writers of supernatural stories such as Ramsey Campbell, T E D Klein, Poppy Z Brite and Karl Edward Wagner, who took many of the themes of the earlier masters, but transposed them into modern, often urban, settings. The loneliness of old empty houses is replaced by the alienation and isolation found in crowded streets, where more modern terrors await the unwary. I have noted the current popularity of all forms of supernatural fiction, from out and out horror to the romance of the 'dark fantasy' paperbacks (now a separate genre in Waterstone's). However, you can, perhaps, have too much of a good thing and I would not have wanted to forego the thrill of discovering those classic tales by digging around in out of the way places when such finds were rare.